2018 Phi Beta Kappa inductees pose after a Commencement Weekend ceremony in their honor. Photo by Carl Socolow '77. 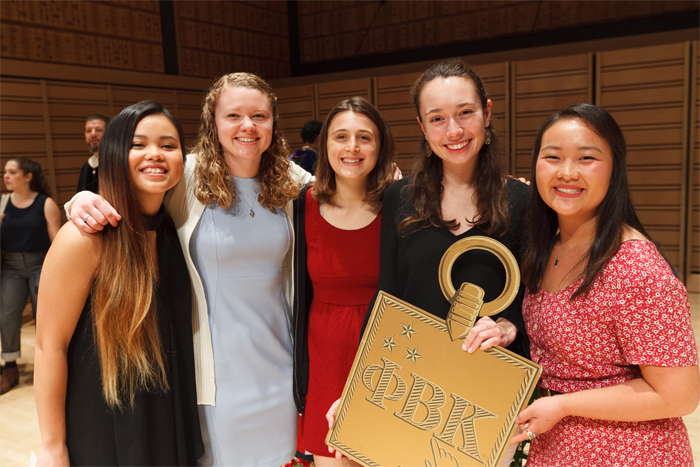 Dickinsonians have long known that the college’s chapter of Phi Beta Kappa (PBK) is outstanding, but now it’s official. During a ceremony last week, PBK’s legislative body bestowed an “outstanding” award on the society's Dickinson chapter, Alpha of Pennsylvania.The national award includes a $500 prize to help winning chapters continue their good work. Dickinson is one of only six PBK chapters across the United States—out of a pool of nearly 300—to earn PBK’s highest honor, based on success creating meaningful experiences for student members and furthering the arts and sciences on campus. Only one other liberal-arts college was so honored this year. The oldest undergraduate honor society in the United States, PBK has promoted excellence, freedom of thought and expression, and liberal arts and sciences since its founding in 1776 (Dickinson's chapter dates to 1887). Membership is based on grade point average and record of conduct. The “outstanding” award was bestowed by Phi Beta Kappa’s 45th Triennial Council, which met Aug. 2-4 in Boston, Massachusetts, to charter new chapters, elect new leadership, discuss policies and recognize top-performing chapters. More than 200 faculty and staff members from elite colleges and universities attended. As president of an honored chapter, Fischer was invited to serve on a panel and share advice on how best to engage faculty and staff in PBK programming. The "outstanding" designation arrives five years after Alpha of Pennsylvania was recognized by the PBK Committee on Chapters as one of the top 20 chapters in the nation. According to Ann McCulloch, director of chapter and association relations, Dickinson’s chapter was distinguished by its strong faculty and staff involvement; engaging campus programs, including guest salons and visiting scholar residencies; cross-campus partnerships; and special events, including a scholar ceremony, a presidential reception for inductees and recognition of inductees at Convocation and Commencement. Phi Beta Kappa has become a key component of the Dickinson Four, a unique program that helps students at all stages of their educational journeys to make the most of their undergrad years, noted Fischer. " 'Love of learning is the guide to life' is the PBK motto, and it's something we seek to instill in all of our chapter and college programming," she added.